Mr MB heard on the local ABC radio about a Food Trail tour, part of Innisfail's excellent annual Feast of the Senses, that included a visit to the Yamagishi Happy Egg Farm. These are the only eggs eaten in the MB household, a dozen or so super jumbo eggs are purchased each week from Rusty's Markets. The duo booked in for the tour which included visits to Yamagishi, Liverpool River Banana plantation, Off the Rails Cafe in South Johnstone and the Mungalli Dairy (another of MB's food heroes). 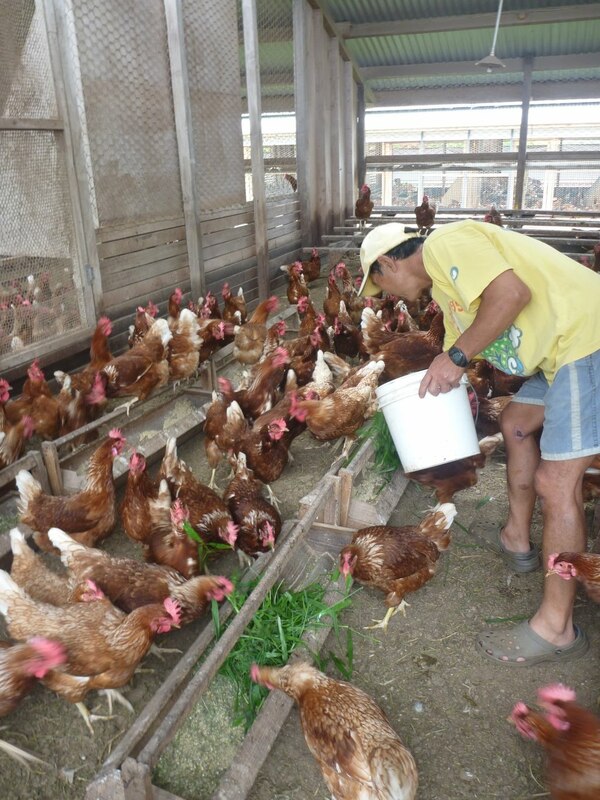 The Yamagishi farm is located near Innisfail, established and run by a Japanese family and has around 18,000 hens which are fed daily with fresh cut grass and fresh tablelands corn, the hen houses are extremely clean with plenty of room to move for the hens. MDR is allergic to chook poo, but he didn't suffer any ill affects at all. MB was very excited to help collect 110 fresh eggs, some of them still warm. It should be noted that an "incident" of mass food poisoning at a Cairns hotel a couple years ago was tracked back to these so-called "happy eggs". I along with many other concerned restaurateurs in town stopped with the "happy eggs" immediately as the breeding practices by this farm are the core of the problem. Also once you get your eggs it is how they are stored and stock rotated that can be the issue. I have used happy eggs in my business now for a while and absolutely love them. They are always fresh and you can tell the yolks are bright yellow and the whites are firm and clear - the sign of a great egg to me. I come from a farm and had my own chooks so know a good egg when I see one. Yes their eggs are so fresh compared to eggs even organic eggs I bought from supermarkets. The egg whites of other eggs I bought are thin and runny. Also their price is so affordable especially when I buy them at rusty market. Love their eggs. I am always looking for the good egg, especially with the realisation of terrible egg practices by other companies. Greedy! The Yamagashi egg is so far the best viewing their farming practices and looking at the reviews on them makes me want to only buy these eggs. If i was able i would have my own chooks, but unfortunately the python puts a halt on that.